Israel Passes Law Retroactively Legalizing Settler Homes On Palestinian Land : The Two-Way The law voted on by Israel's parliament legalizes almost 4,000 unauthorized homes on private Palestinian land in the West Bank. Critics say the move is a massive blow to any future peace deal. Palestinian laborers work at a construction site in a new housing project in the Israeli settlement of Maale Adumim on Tuesday, after Israel's parliament approved a law that retroactively legalizes thousands of West Bank settlement homes built unlawfully on private Palestinian land. Israel's parliament has passed a law that retroactively legalizes almost 4,000 settler homes built unlawfully on private Palestinian land in the West Bank, a move that critics say is a massive blow to any future peace deal. The Knesset approved the legislation in a 60-52 vote Monday evening, at a time when Israel has ramped up plans for settlement expansion in the West Bank. It has announced plans for thousands of homes since President Donald Trump was inaugurated nearly three weeks ago, to the cheers of Israeli hardliners. 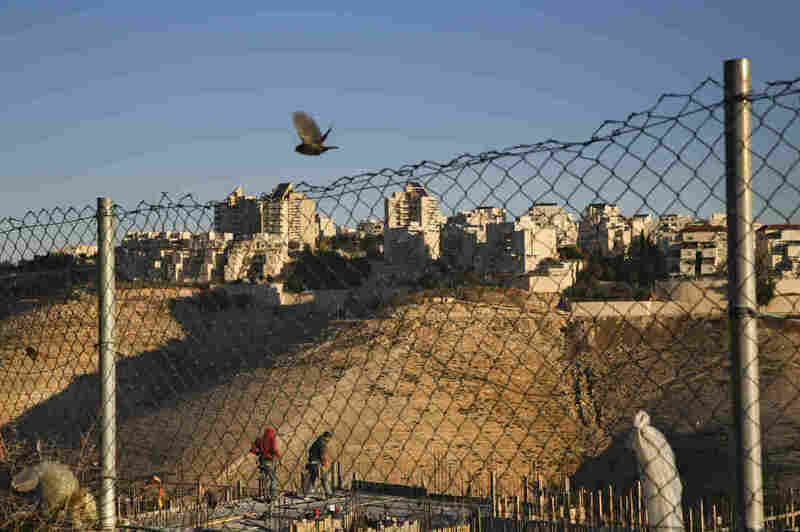 Settlements are broadly viewed as an obstacle to peace by Palestinians and the international community. The Israeli newspaper Haaretz describes the measure as a "land-grab bill." Rights groups have vowed to challenge it at the country's Supreme Court. The U.N. says settlements on land captured by Israel nearly 50 years ago are illegal under international law. Some settlements in the West Bank were built with prior Israeli government approval; the homes in question in this law were built in illegal outposts on Palestinian land. According to the Knesset, the Palestinian landowners would be forced to accept compensation, either financially or in the form of "alternate plots." The vote is another major victory for Israeli hard-liners. According to The Associated Press, Israeli Cabinet Minister Yariv Levin called it "a first step in a series of measures that we must take in order to make our presence in Judea and Samaria present for years, for decades, for ages." Judea and Samaria is the biblical name for the area that makes up the occupied West Bank. Even as Israel green-lighted plans for thousands of new settlement homes and has now retroactively approved others, it began the process of demolishing the illegal Amona outpost last week, sparking scuffles between settlers and security forces. Like the homes described in the new law, Amona was built without prior government authorization. However, the text of the legislation specifically excludes Amona and any other buildings that previously received final demolition orders from the courts. The measure caused an outpouring of scathing criticism from the U.N., human rights groups, Palestinians and other members of the international community. Israel's own attorney general, Avichai Mandelblit, has called the law unconstitutional and said he "will not defend it in the Supreme Court," according to the BBC. "This is a political decision. and the political message from the Israeli prime minister and his very extreme coalition is that they're not heeding the law of the international community," Hussam Zomlot, an adviser to Palestinian Authority President Mahmoud Abbas, told NPR's Joanna Kakissis. "Tonight it became clear that [Israeli Prime Minister Benjamin] Netanyahu is willing to compromise the future of both Israelis and Palestinians in order to satisfy a small group of extreme settlers for the sake of his own political survival," said the Israeli human rights group Peace Now. "By passing this law, Netanyahu makes theft an official Israeli policy and stains the Israeli law books." U.N. Mideast envoy Nickolay Mladenov said it "opens the floodgates to the potential annexation of the West Bank," according to the AP. "It will have a drastic legal consequence for Israeli and for the nature of its democracy," he said. "It crosses a very, very thick red line." The beginning of Trump's term has appeared to embolden hard-liners' plans for settlement expansion. Last week, the White House issued a statement saying that it does not consider settlements "an impediment to peace," but it added that "the construction of new settlements or the expansion of existing settlements beyond the current borders may not be helpful in achieving that goal." According to Reuters, a White House official stated that the Trump administration will now "withhold comment on the legislation until the relevant court ruling."